Today is the first day of a long summer weekend trip to Chicago for our family. We live in the Twin Cities – just about 400 miles away – but haven’t gone to Chicago for fun in more than 15 years. I’ve been there dozens of times on business – we even used to fly down and back for lunch meetings at our ad agency regularly. The last family trip we made down to Chicago was a driving trip. According to Google Maps, it is about a 7 hour trip through Milwaukee. With stops for food, gas, road construction, and rush hour – we’re staying right in the Loop – I think 8 hours would be about right. I have a speedy friend who says he can do it in 5 hours, but that would require an 80 mph average speed – without stopping or road construction, which is an inevitability this time of year. 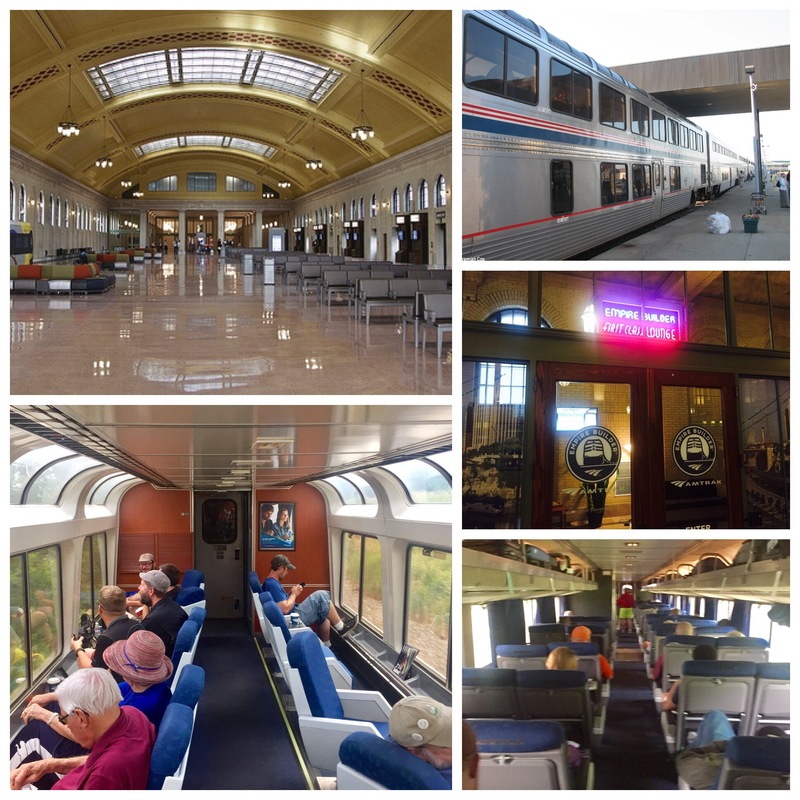 Since we’re not working now – I thought it would be a great time to try out passenger train service from St. Paul’s recently restored Union Depot to Chicago’s proud old Union Station. 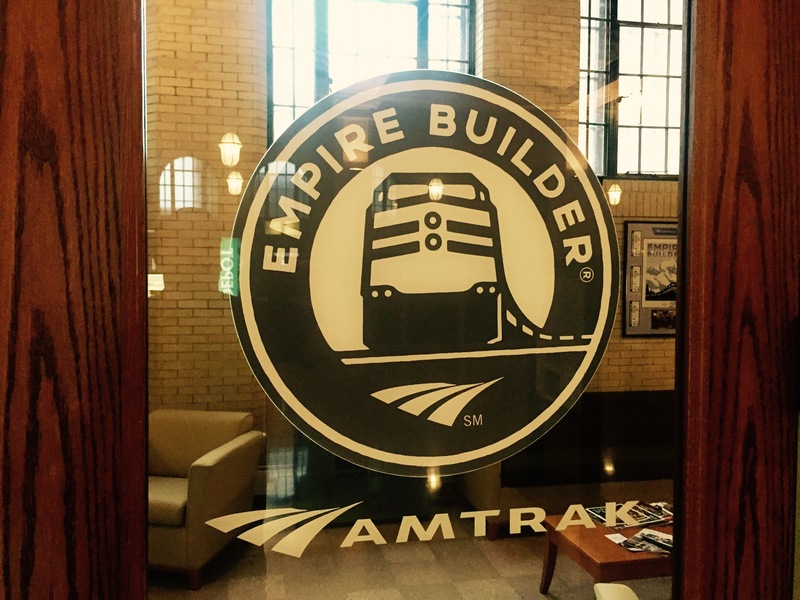 The Amtrak Empire Builder SuperLiner left this morning at 8am and will pull into the Windy City 7 hours and 55 minutes later (3:55pm). The fare – for the three of us – was $420 round trip ($108 each). With the IRS mileage rate at $0.535, the price over 800 miles is almost perfectly a wash with driving ($428). Three plane tickets would have been about $150 more, but shaved the hours off considerably. That said, my experience has been that plane fares often look cheap, but there are an unbelievable amount of extra taxes, fees, and charges that tacked on. I don’t think I would have chosen to take the train if I had still been working. We probably would have spent the extra money and taken a flight. Time is more important than money when you are working – you are happy to throw a little extra money at a time crunch. Paradoxically, while most people retire to get more time, it also changes the way you use it. In our new lifestyle, time is more something to be comfortably used, and less something that gets ‘burned’ moving from activity to activity. That’s the idea behind the train today – time to sit, read, surf the web, or write this article. From the train, we are quietly chugging alongside the Mississippi River – nearly a mile wide in some places – with an interesting view of rugged limestone bluffs, morning fishing boats, and American bald eagles who seem to enjoy swooping by the SuperLiner. The Amtrak passenger train service recently got a new CEO – Richard Anderson – who formerly ran Delta Airlines (and Northwest Airlines from the Twin Cities, before that). While the Empire Builder today is on time and reasonably efficient, I hope he will be able to take a few lessons from the European and Japanese train systems we have enjoyed in the past. Many of those rail systems are amazingly clean, efficient, and enjoyable to ride versus plane travel. I was amazed in Tokyo last year that they have a 200 mph Shinkansen bullet train leaving for Kyoto every 10 minutes (even on a Sunday afternoon). They clean the cars, load the passengers, and shoot out of the station like nothing you have ever seen. I’m not sure we will ever have – or will ever need – efficiency like that, but I’m sure there are lessons that can be incorporated here. Please post a few pictures of the Chicago Union Station. Last time I was there it was shuttered and the trains used the building next door. Enjoy! I will – but it will have to be in a few days. We arrived at US – but a different concourse across the street from the main, historic terminal. I took Amtrak from NY to D.C. for business once and it was a great trip. Looks like a great way to travel Enjoy! I have taken a few train trips on the East Coast. Everything is so close there – and the traffic is so bad – that train travel works very well. Great post and pix, Chief! Particularly love seeing side-facing seats. They look comfy and inviting. It makes me want to take a similar train trip soon. I’m hopeful that Mr. Anderson will be a strong new CEO for Amtrak. In my experience, his tenure at NWA and DL led to excellent improvements in service. I agree with your assessment of Shinkansen in Japan. They are modern paragons of speed and efficiency, and have been for several decades. It’s sad that our country is so behind-the-times in rail travel. Long-term under-investment in existing rail infrastructure, especially in the heavily trafficked Northeast, have led to dangerous derailments and chronic delays. When I compare that to my fast and fantastic rail trip on LTV from Madrid to Barcelona in Spain (a country many centuries older than ours) it makes our US system pathetic by comparison. Nonetheless, enjoy the ride, FIREfighter! Very cool! That’s not the kind of “slow travel” I usually read about, but the train sounds like a fun and relaxing way to pass the day as compared to driving — I’ve made the Mpls to Chicago drive quite a few times. Traffic can be a nightmare once you’re close enough to see the skyscrapers. And “rush hour” never seems to end. Our train arrived in Chicago right as rush-hour was beginning. We could see the highway is packed with traffic as we glided by on the rails to Union Station. I just got back from an Amtrak trip from NY to LA through DC, Chicago and Albuquerque. It is a lot more fun than driving because you see more scenery, can play card games (which I don’t recommend doing while driving) and eating in the dining car is a fantastic way to meet curious new people. Wow – that is quite the cross-country trip! We haven’t gone on and on the night train trip ever before, but we have one planned this fall in Scotland. Amtrak can be a great way to travel (as long as you aren’t trying to go through New York Penn Station right now! ), especially to get right into and out of big metro areas, especially on the East Coast. Airplanes are definitely faster, but when you factor in the time involved in getting to the airport early, and then getting from the airport (typically on the outskirts of the city) into downtown (where many of the train stations are located), the time advantage isn’t always that big, until you start getting into trips like yours of several hundred miles and longer. Plus, as your pictures show, it’s a lot easier to get up and really stretch your legs on the train than it is on a plane! Being able to move around the train was fantastic. In addition to the coach seating car – which had business class sized seats – we also hung out in the vista lounge car. If we had explored more, we would could have walked over to a dining car as well. Next Next post: Cryptocurrency – Fad or Future?